The coconut crab is a large edible land crab related to the hermit crab, and are found in the tropical Indian and Pacific Oceans . They eat coconuts for a living! How would you like to be on an island and come across a crab that is more than 3 feet from head to tail and weighs up to 40 pounds, with a pair of large pincers strong enough to open coconuts! They can climb trees too, but they only eat coconuts that have already fallen to the ground. 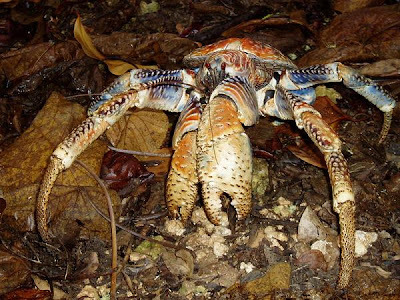 Coconut crab meat has been considered a local delicacy. 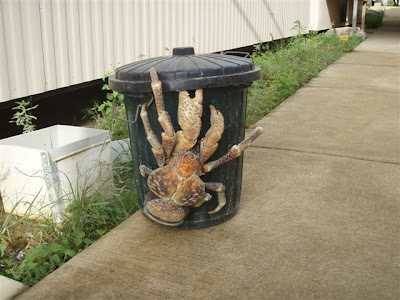 This photo gives you a good idea of how large these crabs are - a coconut crab is seeking food from a black trashcan. Coconut Crab (Birgus latro) is the largest terrestrial arthropod in the world. It is known for its ability to crack coconuts with its strong pincers in order to eat the contents.